There comes a time in every woman’s life when she’s determined to get a fresh start. In many cases, this involves a fabulous makeover to bring out the best in her features. 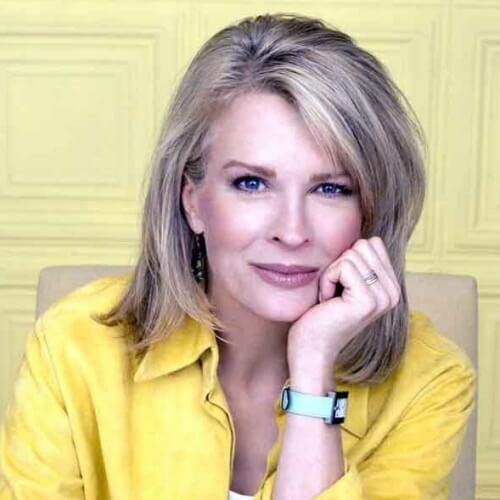 Thanks to our handpicked hairstyles for women over 40, you will surely discover the most sensational hairstyle that doesn’t depend on your age. Enjoy them all below! Don’t let your ripe age lead you away from cute and flirty hairstyles. If you’re looking for a chic yet low maintenance haircut, try this short hairdo for women with straight hair. It will bring out the best of your youthful soul. If you haven’t heard about feathered layering yet, you’re in for quite the pleasant surprise. This layering technique mirrors the effect of feathers, adding a textured aspect to your hair. Highly flattering is an understatement for describing the results. A balanced hairstyle can bring you numerous benefits. Indeed, you will enjoy more styling options than with a short haircut. However, a medium-length hairstyle doesn’t come with the hassle that a long hairdo does. Therefore, you get a pretty and practical look. 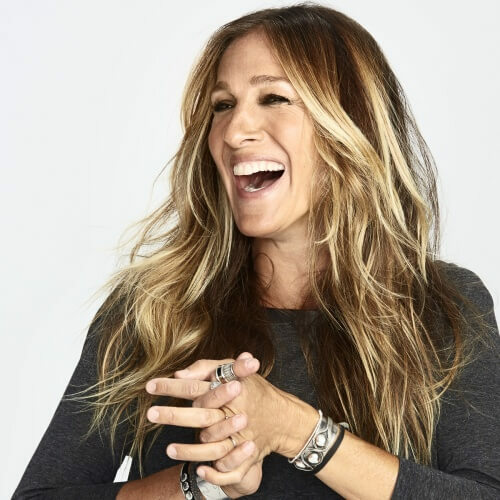 Sarah Jessica Parker is living proof that any woman can age gracefully. Even more so, she shows that ladies over 40 can rock long locks just as fabulously as any high school girl. Sprinkle in some highlights for a beautiful glow all around. With the spectacular rise of natural hairstyles in the African American community, we’re more than happy to encourage all women of color to sport their afro curls. Don’t forget that other women pay a considerable amount to get these curls, so embrace yours with pride! We have to admit that we’re all obsessed with volume when it comes to our hairstyles. If you want to get more without struggling to do so, focus on shorter layers on top. They will plump up your entire hairstyle effortlessly. Sometimes, all you need is a splash of color to brighten up your whole hairstyle. In most cases, you can achieve a more vivid look simply by adding some highlights. Blonde is the most popular option, but you can also go for copper or auburn. Just like with age, size should never matter for a woman with confidence. Even if you have a plumper face, there’s a perfect hairstyle out there to flatter your features. For example, you can choose a short and sassy hairstyle with bangs for framing your face. Have a soft spot for retro glam? You can go back a few decades and get inspired by vintage hairstyles. There are plenty of modern-day celebrities over 40 who rock soft curls astoundingly well. In this red carpet shot, you can see how the lovely Penelope Cruz sought inspiration from vintage trends. You can be the coolest young mom on the block with an attitude-filled haircut. Show off your bold tastes with an extra choppy hairstyle. Get long and wispy bangs and angled layers that will reflect your outgoing style. Your age should never stop you from exploring outgoing hairstyles. For example, ombre isn’t limited to teenagers or young women in their mid-20s. 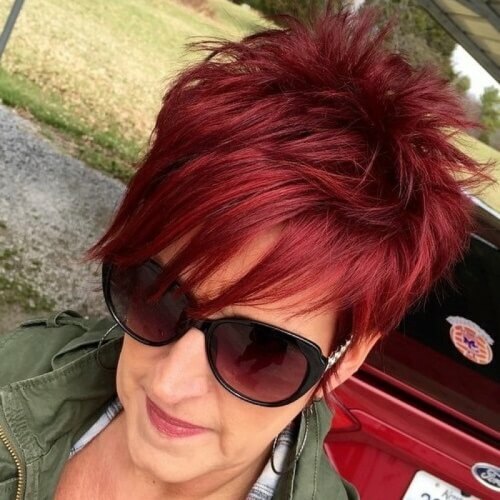 You can rock two hair colors at any age glamorously; it’s all in the way you wear them. 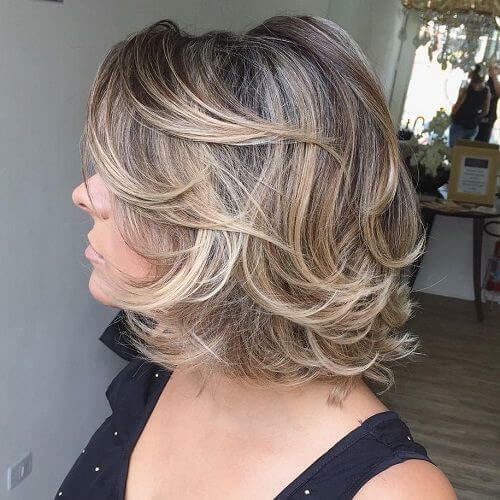 If you’re into the idea of two hair colors but not quite convinced about ombre, you can think about getting a balayage hairstyle. The blend of colors will be far more discrete, which is perfect for women seeking a more natural look. When choosing a hairstyle to go with glasses, you should consider the style of the glasses you wear too. As a result, angled glasses work incredibly well with an angled hairstyle. 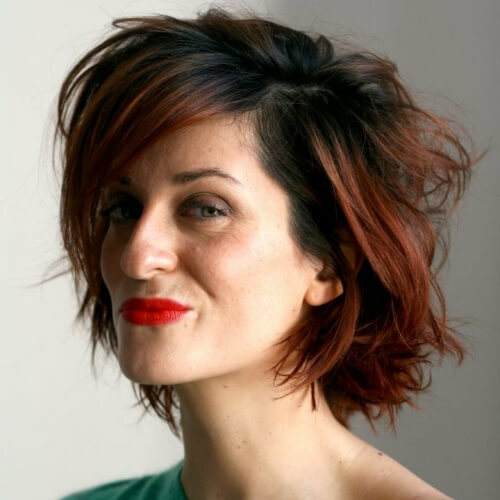 An inverted bob is just what you need in this case. Janet Jackson is yet another marvelous example of how a woman can age with beauty. She chose to complement her lovely heart-shaped face with a fresh short hairstyle with curled tips. African American women can keep this idea among their final choices. Are you more of the bright and bold type? 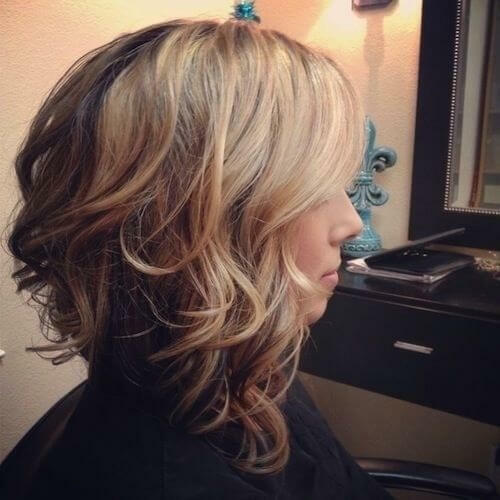 If you’re considering highlights for your new hairstyle, you may want to go with chunky ones. As opposed to standard or wispy highlights, these streaks stand out through more coverage. The secret to properly framing a round face is through strategic angles. In other words, you should think about getting a haircut with layers that you style towards your chin. The results will sharpen your features in a gorgeous way. If you sport longer hair, you can have endless fun thinking about styling opportunities. Just one example is the timeless side braid. Bring out your young side by loosely braiding your hair in a braid and sweeping it carelessly to the side. Curls, especially natural ones, are an amazing sight to behold. They genuinely enhance your femininity with minimum effort, particularly if you have a smart haircut. 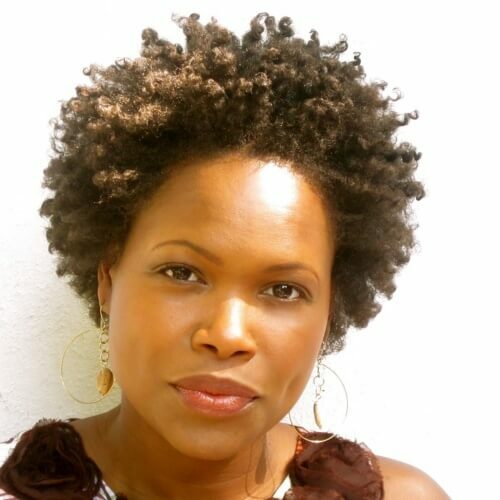 As far as hairstyles for women over 40 are concerned, we recommend a mid-length cut to flaunt your curly locks. Another superb hairstyle for women with medium or long hair is the classy low bun. There are a myriad of variations you can pick from, with or without braids or other styling details. It’s just what you need for a formal event. 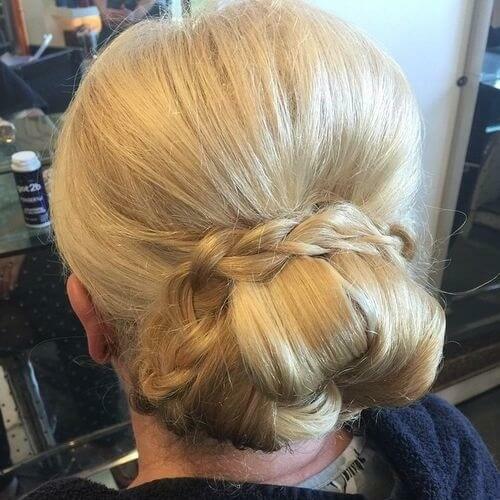 Speaking of fancy occasions, it was impossible for us to not mention updo hairstyles for women over 40. As a rule of thumb, go for any sweeping hairstyle that involves loose strands all around. This idea beautifully works for all hair textures. Out of all hair ranges, we wholeheartedly agree that shoulder-length is the most comfortable and adaptable. Like any medium haircut, it lets you play around with various hairstyles while still being fairly simple to maintain. We can’t deny that fine hair has its fair share of difficulties. It’s challenging to style without seeming too flat. Nevertheless, a well-planned haircut can be the answer to all of your problems. 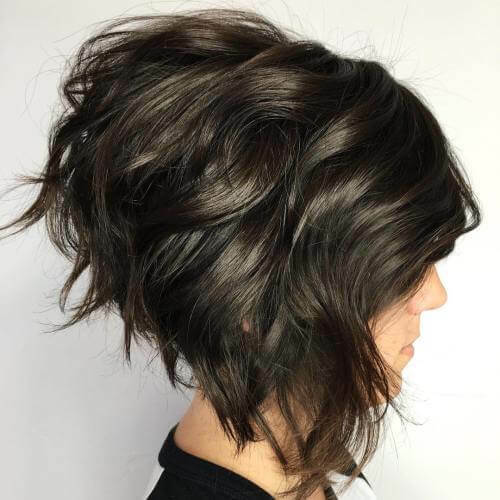 Go for a short cut with plenty of layers to add natural volume. Another way to enhance your youthful side is with a half up half down hairstyle, like Heidi Klum in this pretty shot. If you go for this style, we encourage you to keep it loose and careless to boost the impact of the results. Although this hairstyle won’t work for women with significantly short hair, it can easily be adorned by ladies with shoulder-length locks. The twisted crown, also known as the halo braid or crown braid, is a graceful hairstyle for women of all ages. It’s easy to see why Raquel Welch is just as famous for her hairstyles as she is for her acting skills. She rocks a short bob flawlessly, showing how other women over the age of 40 can do so as well. We also believe those messy, side-swept bangs are fantastic. 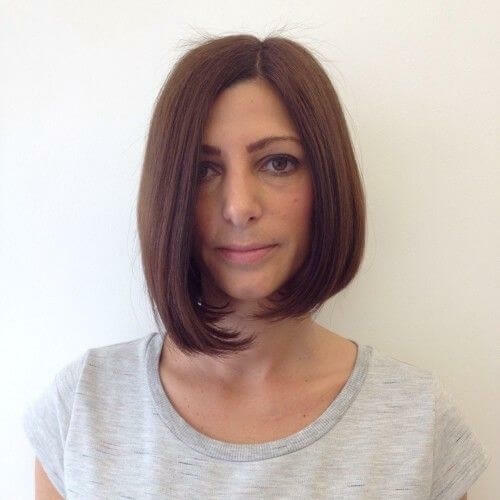 We totally understand why bob haircuts are regarded as some of the most versatile hairstyles available. In addition to their short version, long bobs are also gaining more popularity than ever. Jennifer Aniston proves that they look astounding. Spice up your life with an awesome asymmetrical haircut! It’s one of the hairstyles that will make you look and feel younger than ever before. 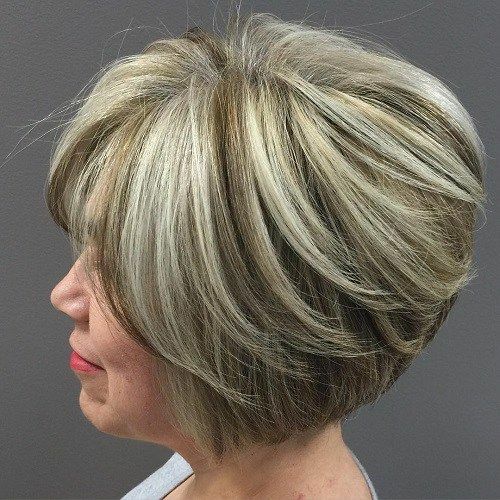 You’ll enjoy a funky fresh look that proves you’re an open-minded woman at any age. 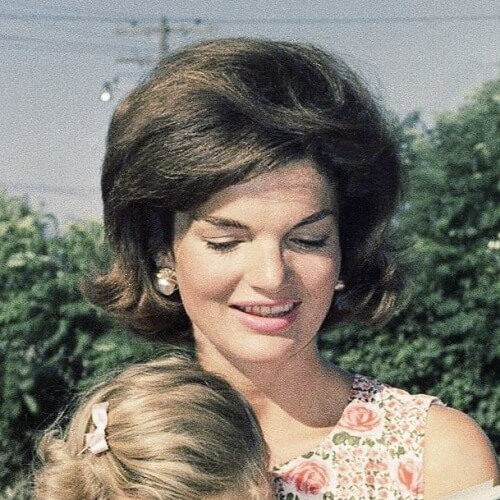 Jackie Kennedy went down in history as one of the most elegant first ladies of all time. One of her signature looks included a glamorous bouffant hairstyle. If you resonate with 60s fashion, this is the ultimate hairstyle for you. If you’re seeking a clean haircut appropriate for any professional environment, this is the optimum look for you. The shoulder-length cut is highly suitable for the workplace, together with the lightly side-swept bangs. The chignon serves as a highly classy hairstyle for the sophisticated woman. Even though it’s usually reserved for formal events, you can also wear your mid-length hair this way in a professional setting or on a special occasion. 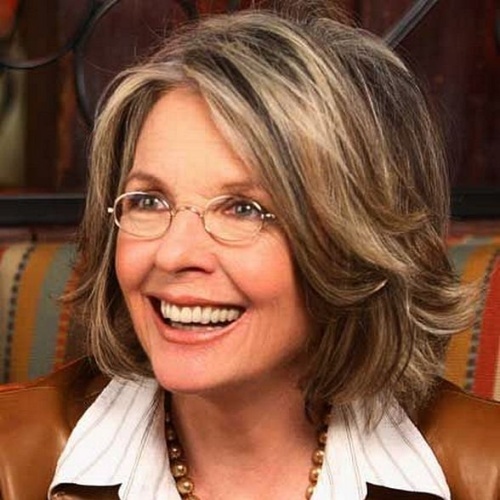 A shag haircut can easily knock off a few years from your appearance. It’s a super playful hairstyle that makes any mature woman shine. Messy layers and styling are essential for getting the perfect shaggy hairstyle. Every now and then, it’s a wonderful idea to fully reveal your facial features with the right hairstyle. In this case, we’re talking about any slicked or swept back hairdo. In addition to letting your face shine, you’ll also get a boost of elegance. 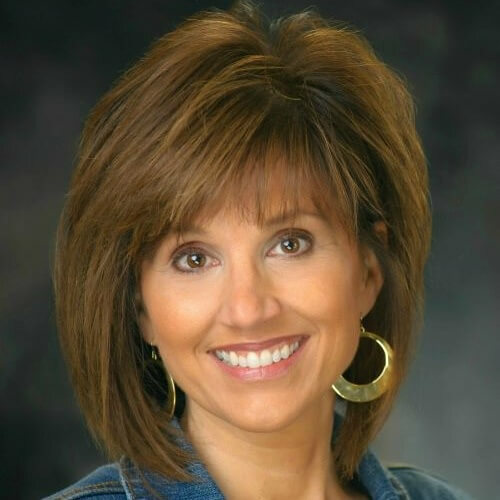 Bangs are a terrific idea for a hairstyle destined for a mature woman. Not only do they help cover up slight imperfections, but they also frame any face shape flatteringly. 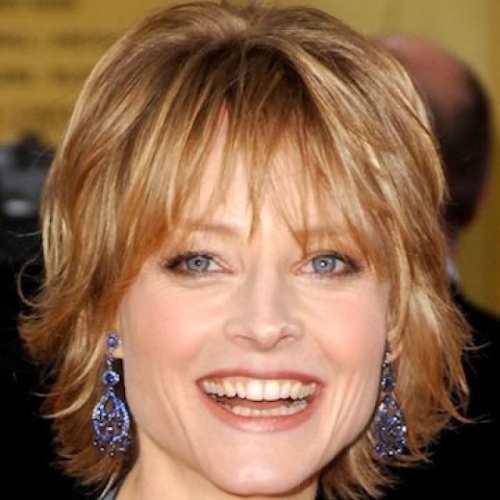 You can choose from countless bangs styles, from parted or arched to side-swept or choppy. 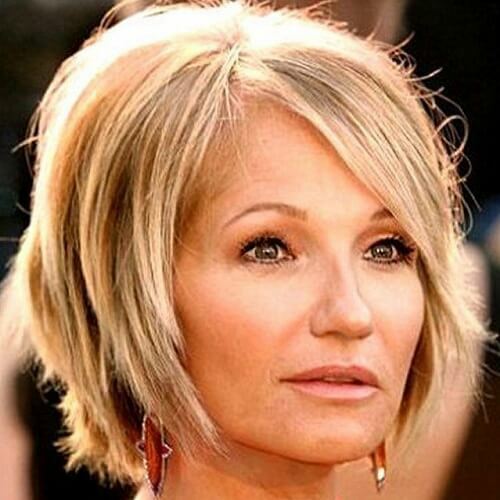 To continue our fabulous series of bob hairstyles for women over 40, here comes the stacked bob. The term ‘stacked’ refers to the cutting style, with stacks of layers piled one over the other. The results are astoundingly voluminous and beautiful. Among our favorite updos is the faux hawk, a daring yet delicate choice for outgoing women. One of the top reasons to sport a faux hawk is that you can adapt it according to the occasion. The styling can vary from graceful to rebellious. Want to keep everything sweet and simple? 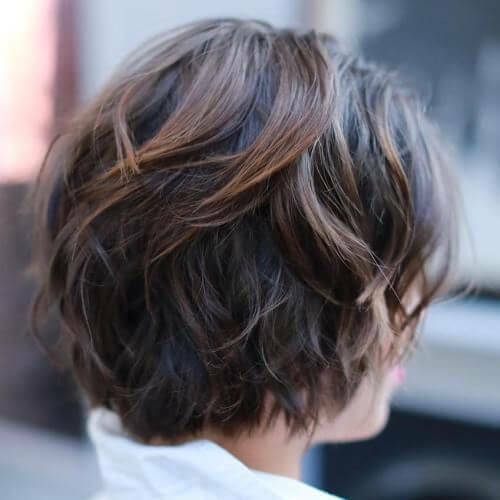 Go for a short haircut with layers galore. Still, we recommend that you don’t keep it too short, so you can create the outline for when your hair grows out. You won’t have any trouble with styling or maintenance. Before we talk about our choice, you should know that the sexiness in any woman comes from her attitude and how she holds herself. After you got these covered, pick a hairstyle to support your mindset. We love Lisa Rinna’s choppy and wild look. 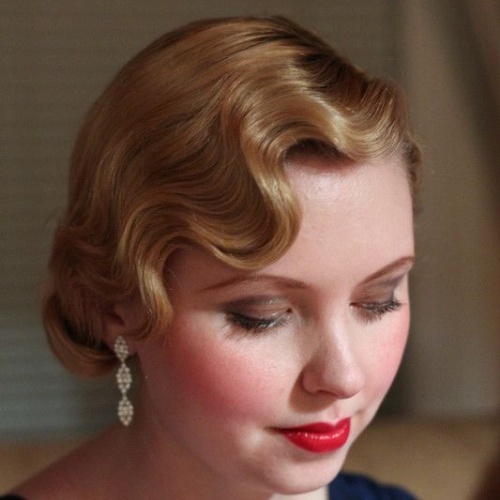 We’re back to old Hollywood glamor for this hairstyle – the unforgettable finger waves. There’s no denying that this hairstyle conveys exceptional refinement, no matter the environment. Choose it if femininity is among your top values. One of the traits that Asian women are blessed with is having jet black, shiny, rich hair. If you’re in this situation, why not make the most of it? Lucy Liu is the ideal example of how a medium-length haircut can enhance your natural qualities. No wonder the French are regarded as some of the most stylish individuals. 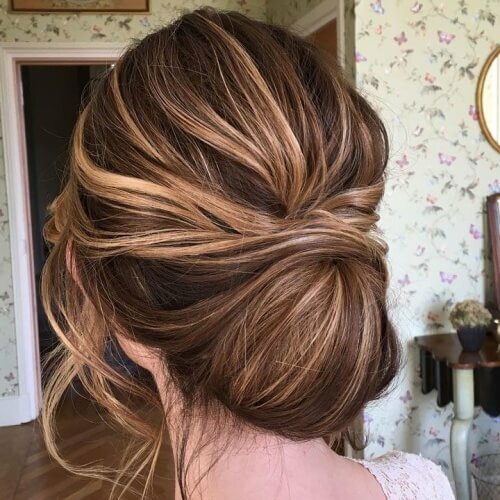 The French twist is just one of their multiple iconic hairstyles. You should think about this tasteful idea if you love experimenting with updos for your mid-long hair. 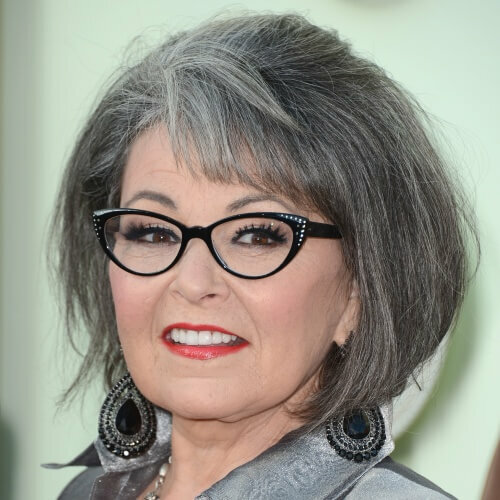 You have already noticed that short haircuts are embraced by women over 40, but what about one of the cutest of them all? The pixie haircut is an adorable choice, with short layers and a graceful silhouette that tends to complement all small faces. 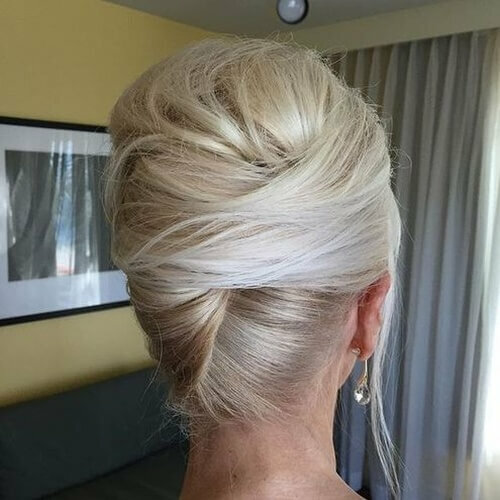 You don’t have to be a certain age to adorn a messy bun with grace. For example, Leslie Mann, at age 45, allows her youthful soul to shine with a loose, casual updo in a flawless way. We also love how she used a ribbon to top off the hairstyle. We have to admit that wavy is the most generous hair texture one can have. You can choose from a wide range of haircuts, from short to long. Get inspired by Keri Russel’s shoulder-length hairstyle for your wavy locks. Have you lived your entire life with straight hair? Perhaps you want to make a change now that you’re going through a new chapter in your life. For this, you can think about getting your hair permed. Be careful and try to avoid as much damage as possible. We’re all for adding some cool spikes to your hairstyle. If you have shorter hair with layers, you can style the back with spikes. It works terrifically well with side-swept bangs, and especially with naturally straight hair. If you have thick hair, you’re quite the lucky lady. Why not make the most of it with a hairstyle that accentuates your natural thickness? For this, all you need is a long A-line bob. It starts shorter at the back and gets longer towards your chin. Ladies, repeat after us: layers are life! All jokes aside, a layered haircut can work wonders for any hair texture. You instantly get more volume than ever before, no matter how long the rest of your hair is. Keep this detail in mind when visiting your hairdresser. Express your free spirit with a short, sassy and textured hairstyle. A choice like this will prove that you’re not afraid to show your true personality. 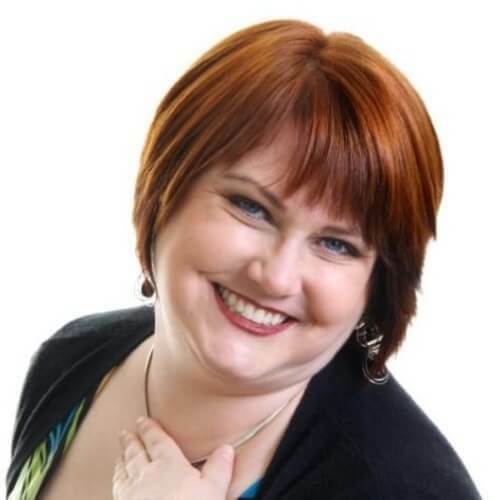 Moreover, we also like how Donna Mitchell embraced her natural hair color in this photo. Thumbs up! What better way to wrap up our article than with an irresistible hairstyle? Sofia Vergara is widely regarded as one of the sexiest women alive, so you can look into her femme fatale style for inspiration. Long, soft, side-swept curls are a must. 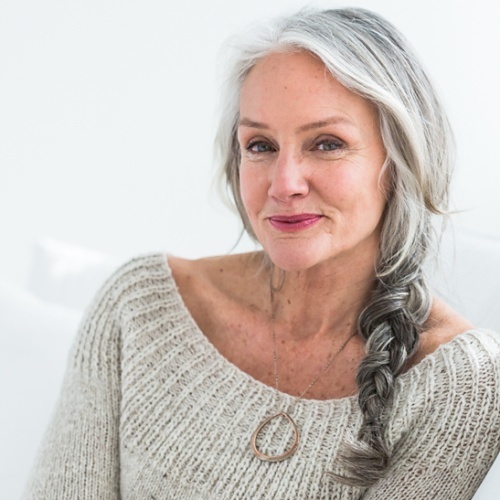 All in all, there are no boundaries when it comes to hairstyles for women over 40. You should never restrict your selection of hairdos due to your age. Whether you embrace your maturity or want to express youthful joy through your appearance, you should always choose a hairstyle that represents you. On this note, which one do you feel the most? Would you add any other ideas? Let us know below!